Virginia Fusion Center: Black and Christian colleges and universities “potential breeding grounds for terrorism”. Colleges and universities in Virginia’s Hampton Roads area are potential breeding grounds for terrorism, a state police report contends. A 200-page report issued by the state police’s Virginia Fusion Center says terror and extremist groups have links to the state’s schools, singling out unnamed historically black colleges and the evangelical Christian Regent University, the (Norfolk) Virginian-Pilot reported Sunday. Apparently referring to Norfolk State University, Hampton University, Virginia State University in Petersburg, Va., and Virginia Union University in Richmond, Va., the report notes that the Hampton Roads region has a diverse population and warns that “a wide variety of terror or extremist groups” have links to its universities, the newspaper said. The report does not explain why the black schools are singled out. It drew criticism from Caroline Fredrickson, director of the American Civil Liberties Union’s Washington legislative office, who mentioned the Virginia report in congressional testimony last week. Gotta agree with the ACLU on this one. Minority party forever, I tell you: Rob Wittman (R-1st) submits $94,676,000 in earmark requests. Nice to see the government is cutting back. More on this later, kids. You know, I’m starting to get annoyed with attacks on my “leftist” blog “that is used almost exclusively to support the Democrat Party”. Seriously, two people made those comments. Feel free to share this with anyone who cares. I will not be bullied by a leftist blog who wouldn’t understand the truth or rightousness or freedom if it bit him you-know-where. To peddle a “quote”, opinion or analysis from a blog that is used almost exclusively to support the Democrat Party, which was motivated by a person who has expressly stated that he has (and still) supports Albert Pollard (the liberal Democrat incumbent whom this candidate will face), is reprehensible. Holy cow, when did Bill Bolling, Ken Cuccinelli, and DJ McGuire (see right sidebar) become Democrats? I swore I was supporting them due to their impeccable conservative credentials, but alas, it must be because they’re Democrats. I’m sure former Caroline County Supervisor Calvin Taylor, former Commonwealth’s Attorney Harvey Latney, and former Sheriff Homer Johnson (all Democrats) would get a good laugh out of that diatribe for sure. Webb’s comments boils down to the fact that he has absolutely no defense to the fact that he’s supporting a candidate that has gone on the record several times saying that the federal government was responsible for the Oklahoma City bombing, so he has to result to ad hominem attacks. “Oh, he just supports Democrats, ipso facto, he’s lying!” I guess The Washington Times, Outside Magazine, High County News, and Catherine Crabill herself must also support Democrats “exclusively” as well, since they’re the ones responsible for the quotations. But don’t believe your lying eyes, after all, this is a “leftist” blog “that is used almost exclusively to support the Democrat Party”. Virginia Virtucon blasts Catherine Crabill, calls for reopening of filing for candidates. They have an absolutely great photoshop of her too! Catherine Crabill’s insanity demonstrated in her own words. Gotta love how she’s smashing environmentalists when the chairman of the 99th Legislative District Republican Committee, Allen Webb, was attacking Delegate Pollard for supposedly failing to bring “‘green’ businesses” to the area. Hack “journalism” from the Capital News Service at VCU. Amy: Did it occur to anyone to inquire what was going on at the time? Had the VCU reporter told the full story, she would have mentioned that at that time no votes were being taken, and I actually recall we were in a recess “break” awaiting Senate action. We get on line all the time to respond mostly to constituent inquiries. I get 100’s a day and its tough to keep up. At the time of this report, I was looking at house values in Mason Neck b/c I had a constituent write, all upset about his County Real Estate Tax. But the “reporter” did not give any subject of the report an opportunity to respond. Just a slam piece taken out of context. Um…excuse me, you have to be told that there’s a recess going on when you’re in the House gallery and can see and hear everything going on on the House floor? 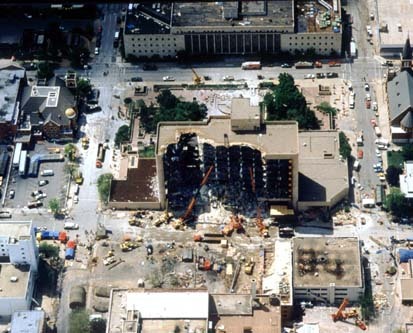 14 year anniversary of the Oklahoma City bombing. I can’t believe it has been so long. 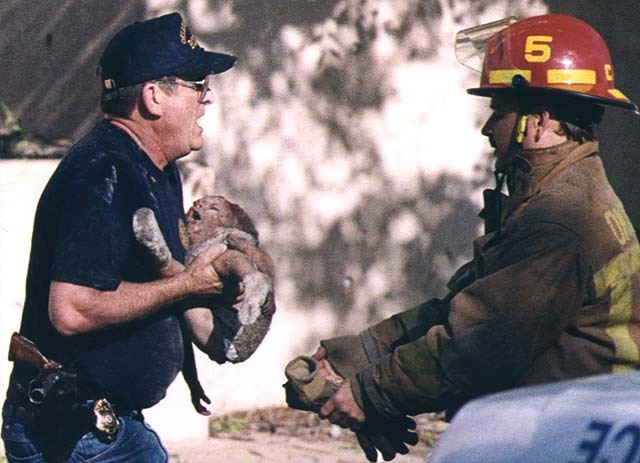 Fourteen years ago at 9:02 in the morning a truck parked outside the America’s Kids Day Care Center exploded. The blast, fueled by a fertilizer-diesel mix, was felt up to sixty miles away. It obliterated the day care center and brought down a third of the building. It shattered the windows of nearby buildings, killing or injuring many outside the target. I’m talking, of course, about the Alfred P. Murrah Federal Building in Oklahoma City. Ultimately, 168 people, including 19 children, were killed. 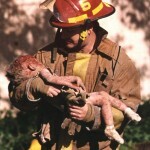 Three unborn babies were also killed. I was in junior high school at the time, in Stillwater, Oklahoma. It was a Wednesday and for some reason I was out of the classroom. I don’t remember if I was running an errand for a teacher or what, but I do remember that I was on my way back to class when I passed the main office. Unusually, the TV was on, and quite loudly. It looked like everyone was gathered around it. So I wanted to see what was going on. There was much more confusion that morning than is remembered now. Now we know that there was only one bomb, the Ryder truck. 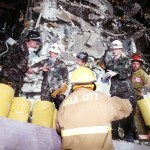 But back then there was a series of bomb scares during the rescue efforts. That was the first thing I saw and the strongest images I have of the bombing. It was live footage in the street near the Murrah building. 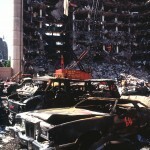 I remember seeing people sitting or standing, most of them crying or clutching injuries. There was blood. There were EMTs and firemen. And then suddenly so many people were running away. It wasn’t immediately apparent why they were doing that–and then the cameraman started running too, which added another element of confusion. It was all very hard to believe. 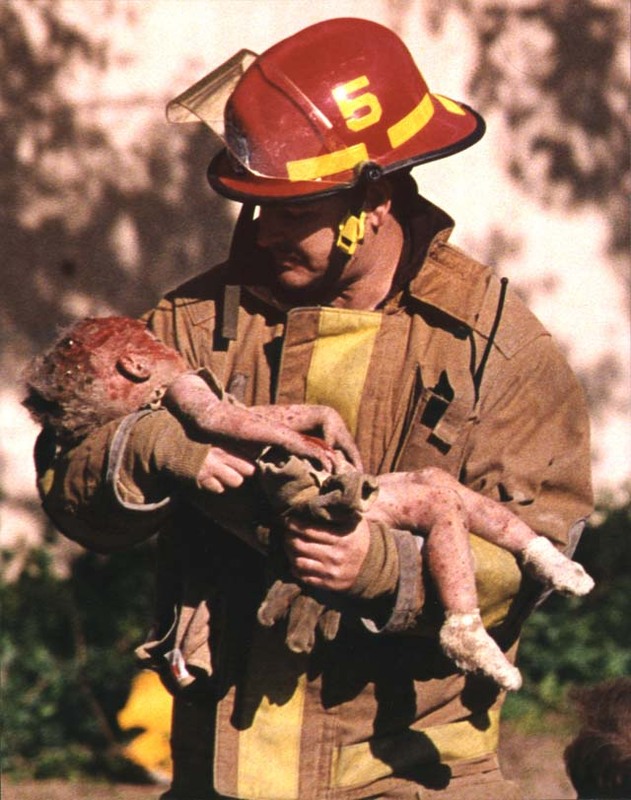 Not just a bombing in Oklahoma–really? Oklahoma? But an on-going attack. I was so confused because the people I’d seen on TV were already hurt and the EMTs and firemen were already there. When you’re a child you think, “Okay, the good guys are here; you can stop being afraid.” But that wasn’t the case, and I only realized it that minute. If I had to list the important formative events in my life, that would be right near the top. When I got back to the classroom I didn’t say anything to anyone. I didn’t know what to tell them and I could hardly believe it myself, even after seeing it live and hearing the people in the main office crying. It was the same experience I had six years later during 9/11 when my first thought upon turning on the TV was that they were showing a movie clip on FNC. This cannot possibly be happening. Sometimes I still feel that way. And, of course, a couple of people over there decided to make snide comments about the post. Thankfully, and I’m happy to see this, the other commenters told them to take a long walk off a short pier, to put it mildly. 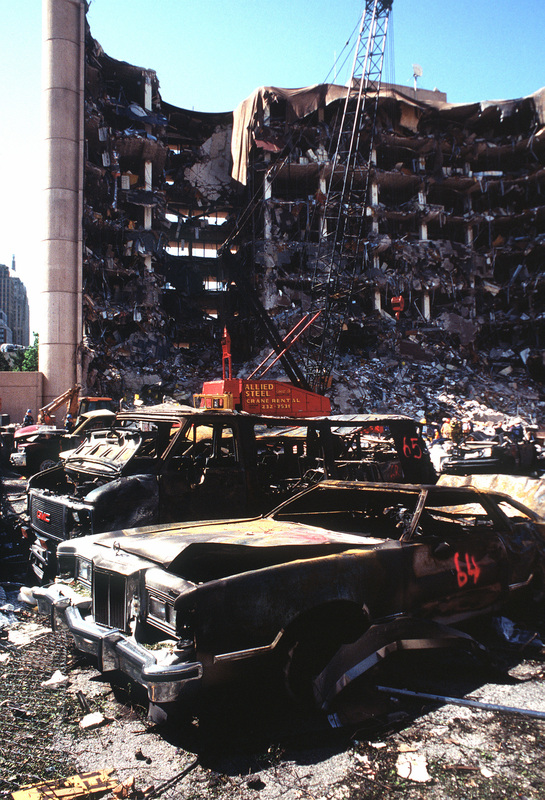 The weird thing is that I don’t really remember the Oklahoma City bombing. Might have something to do with my age (only seven years old at the time). I do vaguely remember the news coverage of the first World Trade Center bombing — one or two fleeting images of smoke coming up from the parking garage (five years old at the time). I remember the news coverage of the Columbine massacre in 1999 (the 10 year anniversary of Columbine is tomorrow as a side note) pretty well, but I was 11 years old by the time that happened. I could probably describe every word and feeling on September 11th, 2001. I remember very well coming out of gym class in the morning and just feeling this weird tension among the teachers and faculty of the school as I went to lunch. It was like everyone was on edge and waiting for something to happen. 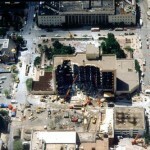 After lunch, I was in the bathroom and two other students were saying that there had been a bombing at the Pentagon. I was thinking to myself, “What the heck are you guys talking about?” After that, I had English class and the teacher came forward and said that two planes had crashed into the World Trade Center, and another into the Pentagon; the teacher didn’t mention that the WTC buildings had collapsed though. Probably a good idea at the time, not wanting to cause a panic or anything. At the time, I was thinking “planes” as in something the size of Cessna. I didn’t learn how bad it was until I got home and saw the video a thousand times. And the bad thing is that I might not have done this post noting the anniversary except for the fact that there’s a serious politician candidate that believes that the federal government was responsible for the atrocity in Oklahoma City. UPDATE: The Jawa Report also has a post. 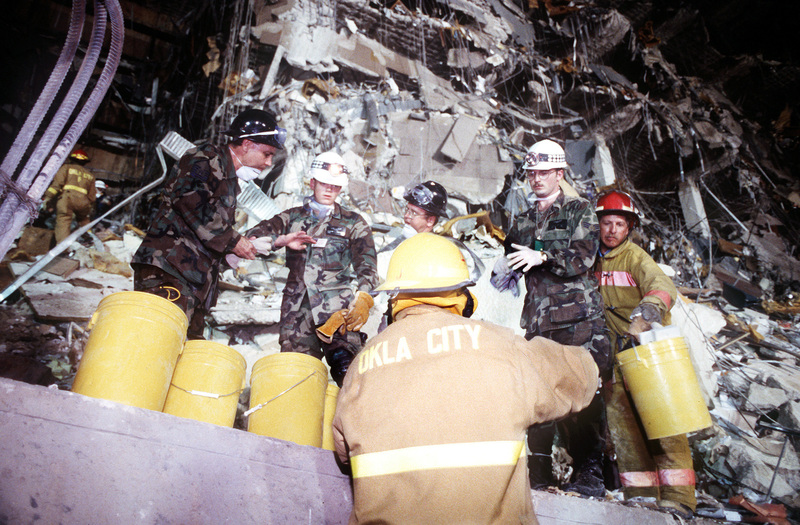 Holy cow, Catherine Crabill still thinks the feds were “culpable” for the Oklahoma City bombing. You just can’t cure stupid, that’s for sure. The Free Lance–Star shows its utter contempt for the citizens of Caroline County. HAD IT FOLLOWED a trajectory of indifference just a few years ago, Caroline County now would be a place where residents of one rural community waded through raw sewage; children’s teeth rotted in their head, causing them so much pain they could not follow their teachers’ instruction; and many county people found it hard to borrow a book or log onto a computer. Yeehaw! We bango-playing slack-jawed yokels here in Caroline County can’t do nothin’ without the benevolent government doin’ it for us! We don’t know nothin’ ’bout them series of tubes and that computer box thing! Dentist, what be a dentist? Why, I just use a pair of pliers to fix me teethes! And when did this “tolerance of indifference” end? A later section of the article notes “the turn of this century”. Are they implying that the county government didn’t care about these things until recently? What does that say about Board members that have been on the Board since 1988 or 1992? A lengthy piece detailing Catherine Crabill’s delusional, insane conspiracy theories. In September 1994, word spread through Catron County New Mexico, that two FBI agents and a dozen National Guardsmen were combing the mountains north of Luna, a small town near the Arizona border. Officially, the men were searching for the body of an alleged drug dealer who had disappeared mysteriously a year earlier. But a buzz went around the county that they were really the advance party of a darker event: a pending firearms raid by U.S. government forces. “The federal crime bill had just been passed, and the government had already conducted sweeps in several communities,” says Chris Crabill, a 43-year-old cabinetmaker who lives with his family in the nearby town of Reserve, the county seat. “Ruby Ridge and Waco were also on our minds.” On the night of September 7, Crabill gathered several guns and moved into the woods, hunkering down in view of his house so he could watch over his family while they slept. The next morning someone called a right-wing radio talk show beamed deep into the Southwest from Bakersfield, California, and told the host that “5,000 National Guardsmen have invaded Catron County.” That night, prompted by the new rumor, Catherine Crabill piled her four kids into the family Wagoneer and drove them to her mother’s home in Corrales, in another county, so that “my husband could sleep in the house. We did not flee in terror as some have suggested. But I was scared.” About a dozen other locals also moved to “safer” houses for a day or two. The county’s phone lines hummed with forebodings of invasion. There was no invasion, but eight months later, on May 3, 1995, the Crabills helped organize a community meeting in Reserve to discuss the creation of a militia. Some 250 residents showed up, roughly 10 percent of the county’s population. One by one, cowboys, loggers, and homemakers, folks who generally wave to strangers and keep their doors unlocked, stepped forward to describe a government assault that they clearly believed was imminent. In the end, Catron County did not create a formal militia that night, mainly because the county commission, the previous August, had passed a resolution “encouraging” heads of households to own and carry guns at all times and to keep sufficient ammunition on hand. Before the meeting wound down, the point became abundantly clear: Plenty of people in the county already were armed and prepared to do battle with the federal government or other alien invaders. The citizens of Catron County didn’t need to form a militia. They were a militia. Dripping sandwich in hand, I walk over to Main Street, site of the Independence Day parade, to see how Smokey Bear, official symbol of the hated U.S. Forest Service, will be treated when he appears amid the floats and bands. I’ve been told he might get hissed, booed, possibly pelted with eggs. But when Smokey rounds the corner onto the parade route, he waves, dances, and tosses candy to children. No hisses are heard. Today even Smokey, and everything he represents, gets a holiday. Obviously, the Crabills’ perceptions and philosophies have changed radically since they moved to Catron County in 1992. The last place they lived before that was Santa Fe; before that, Aspen, Colorado, [consistent with Catherine Crabill’s biography information on her employer’s website -ed.] where, Catherine says, “We were definitely part of the coffee-and-croissant crowd–committed environmentalists.” But soon after coming to Reserve, she says, “We began to see through the propaganda and lies of traditional environmentalism. We no longer believe, for example, that cattle are hurting the land. And we don’t trust the things we used to trust.” The startling about-face has everything to do with the Crabills’ immersion in the town of Reserve, the hotbed of Catron County conspiracy theorizing. Catherine believes, for example, that the State Department, at the UN’s behest, is pushing through a “three-stage plan” to disarm the world for its own dark purposes. The dark tides surging in the minds of Chris and Catherine Crabill may sound comical, but they represent an unsettling new western attitude that places like Catron County can’t ignore. The old stereotype of New West settlers like the Crabills is that they’re people who’ve abandoned the swarm of prosperous urban centers to live a ranchette lifestyle. Often they’ve come to the West with very little sympathy for the deep desperation of people whose very worst fear is having to move to the cities that the newcomers have abandoned. Karl Hess calls this tension “the unforgiving reality of the urbanized West,” and he believes the county movement “is simply a momentary aberration, where proud men and women take their final bow” in a world that is changing too fast. As a lawyer, Jim Catron may be content to peacefully test his interpretation of county sovereignty against the government’s. Still, deep down, he must know that the movement he helped create reflects nostalgia for a time when, as he puts it, “Someone causing pain to a community was simply shot.” Whatever becomes of the strange revolution that Catron County has set in motion, it’s already created a frightening possibility: One angry man or woman acting on that nostalgia could place a bloody stain on the legacy of the modern West. Now it looks like Catherine Crabill wants to place a bloody stain on the legacy of the Northern Neck and the Republican Party of Virginia. And, for the record, Catherine Crabill sent a letter to the High Country News complaining about the way she was portrayed in this article. But the best part about that letter is that she details her delusional, insane conspiracy theories in her own words. Check back on Monday for that!